Ever noticed how winter comes and goes and BANG! Suddenly we’ve gained 5 pounds without noticing (otherwise known as “living in denial”) and we wonder how on earth we’re going to lose the excess weight? Well a good place to start is with a little inspiration, and that’s exactly what you’re gonna get with Fitness Dash. A word of caution though – you’ll be sitting for hours playing this one and the only thing getting fit as you play will be your fingers, so remember to go for a jog around the block when you’re done and get a little cardio workout to make it all worthwhile! In Fitness Dash, another Time Management hit in the successful Dash series, Jo decides to open a gym so she can whip her teammates into shape and get them fit for the upcoming Olympics. To kick things off, Jo rents a great little gym from the boxing club and even though it’s nothing fancy or luxurious, it will definitely do the job to begin with! Starting out with two treadmills and two bench press machines, Jo’s job is to refer customers to the right equipment, while trying to match colors for added bonuses; the more consecutive matches, the larger the bonus! Customers can work on their cardio or muscles while Jo makes sure they have clean towels, are properly hydrated with water and orange juice and the equipment and showers remain clean at all times. 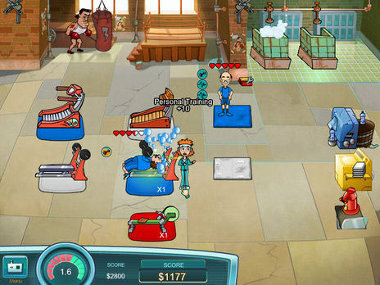 While this may sound easy enough, the game gets very hectic early on and Jo needs to be quick on her feet as the pace starts picking up and various different customers come rolling in; the senior lady who is super slow and keeps hogging the equipment, the super sweaty hungry man (make sure you have plenty of towels ready for him) and the businesswoman who is extremely impatient so… better not keep her waiting for too long! 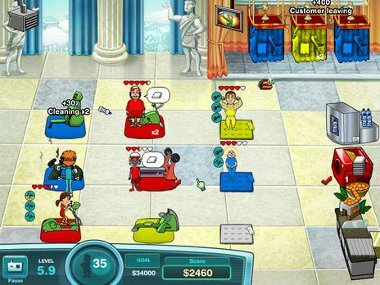 As Fitness Dash progresses and you make more money, you get to upgrade your gym with a Jog-a-Tron 2000, which offers a faster workout for cardio customers, a Miracle Muscle Bench Press and even fancy Steam Jets, to help you clean and refresh customers quicker after a workout. And, don’t forget a new juice machine or the Satellite TV so customers can enjoy a nice treat and some in-house entertainment! While success is sure to come your way, make sure you don’t get complacent and keep an eye out for potential disasters waiting to happen; whether this is the Ice cream man, trying to lure your customers away from their healthy lifestyle or a problem with the shower plumbing. All disasters must immediately be tended to and, should you succeed in averting it, you earn an extra bonus! 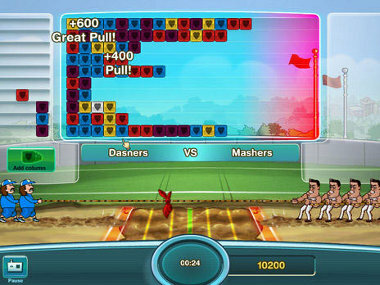 This addictive Time Management Game can be played in two different modes: Story Mode boasts 50 levels across five different locations and includes a mini-game at the end of each location: a tug-of-war game where you must make tile matches of four or more tiles of the same color – the bigger the match, the more the rope will be pulled in your favor! 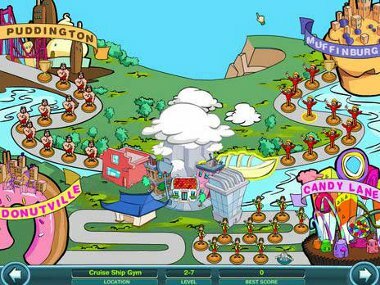 Alternatively, you can play in Endless Mode, which consists of two different options; “Tug-of-War” and “Fitness” and each has three levels of difficulty to choose from; easy, medium or hard. So, now the only question remains… are you ready to hit that treadmill and get into shape? Download and play Fitness Dash for FREE and let the inspiration begin! j aime les jeux d objets cacher et times managements et de détecteve. I cant get amowing progam off my computer Today is the last stray I cant read my owm MOTHERS OBITHUARY with out this crap poping up. EMAIL ME and tell me how to end this! Sabrina1. In my opinion peolpe are not altruistic but rather when they commit good deeds they are responding to moral and social incentives. When it seems like someone is being selfless by preforming a good act or charity that person is actually responding to an incentive for a egotistical reason, which is the exact opposite of altruistic. The moral incentive is used through the person feeling guilt if they don’t help, knowing that helping is the right thing to do. So the reward being that they would have self pride by helping others. A social incentive would be that society praises those who help others, meaning that the individual would want the reward of fitting in with society. So they would act altruistic to be acknowledged as part of the group (society). They conform to societal pressures to be accepted by others. 2. It should not matter why peolpe do positives things for others. At the end of the day the person that has been helped will not care why they were helped but that they were helped at all. For example if someone gives money to a charity that assists in cancer research it does not matter if the only reason they donated money was that they were responding to a moral incentive but that the charity now has more funding. Both parties involved got what they wanted, so it is a win-win situation.